Visit the great outdoors in this hidden object adventure! 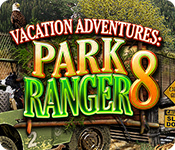 Head on back to beautiful Pinecreek Hills and use your outdoor experience to help the rangers in this hidden object adventure! Fun Kids Games adults can buy and the whole family can play and enjoy! Help the Rangers take care of the Park and Wildlife! Take a fabulous cruise aboard USS Liberty of the Waves. A Magical Christmas Wonderland Adventure for the whole family! An awesome new world cruise! An outstanding adventure in Pinecreek Hills National Park! Work as a Cruise Director on the cruise of a lifetime! Beautiful HOG in the Great Outdoors! Set sail on the luxurious‚ USS Liberty of the Waves! Join the best and biggest Easter Egg hunt ever! The latest Christmas Wonderland adventure is here! Santa’s awesome adventure in Wonderland! A fabulous Christmas game for the whole family to enjoy! A sensational trick or treat adventure with Mike and Emma! An awesome new Christmas Wonderland game for everyone! Explore an incredible underwater world!